It’s spring, it’s spring, it’s spring and I’m super-excited! Not because of the warmer temperatures that are sure to come (and stay). But because it will soon be time to plant up some stunning containers and add some much-needed color to help dissipate this dreary winter hangover. I love the time of the year when the colorful annuals begin to show up on the plant benches. That feeling I get when I walk through the nursery and think I want this one, and this one, and this one…. That little tinge of uninhibited pleasure that just erupts from within and does its little spring jig within my heart. But, I have a challenge for you this spring. It’s time to say bye-bye to your container comfort zone and hello to new and exciting plants that put the WOW in your containers. No more geraniums, spikes and vinca vine. 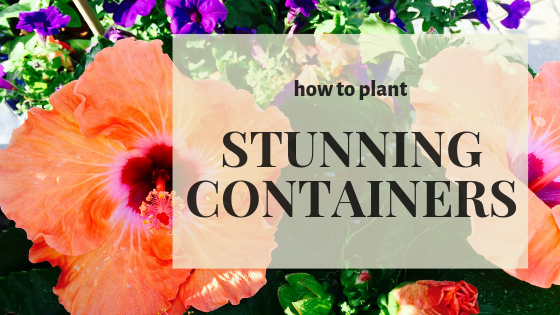 I’m talking truly stunning containers that are actually super easy to create! All it takes is a few simple steps and voilà! Stunning containers!! There are two important factors to consider when choosing the perfect container: color and size. Color: Choosing your container based on color is done strictly for aesthetic reason. You may want to match an accent color on your home or the pattern on your furniture cushions. You may also choose a color that has an antique finish to match a rustic French country garden thing happening in your landscape. A colorful container will stand out and make a statement but beware, it can also limit the color pallet for your flowers. Pro Tip: Don’t feel like you have to have a bright container. I’m a plant person at heart so I tend to pick black, brown or terracotta containers – any neutral color that will become the backdrop to the floral arrangement. I actually use a mix of black and gray containers with assorted textures and finishes at my home. Size: The size of container you choose is more likely to be dictated by the space you have to place it. Large containers or a grouping of large containers work beautifully around a pool or large patio. In the area around a front door where space may be limited, a tall, narrow container or urn may be the best choice. Also, keep in mind that the smaller the container is, the harder it will be to keep watered during the summer when it’s packed with roots. If you have small containers, keep them close to your home for better access to water or use them in the shade where they won’t dry out as quickly. Don’t be afraid of the big guys. A well-made container will be able to stay outdoors year-round, which is good since it’s next to impossible to move some of these containers. Expect to spend some money on the large, well-made pots, though. A large container may run anywhere from $150.00 and up. They are an investment, so put some thought into what style you want. 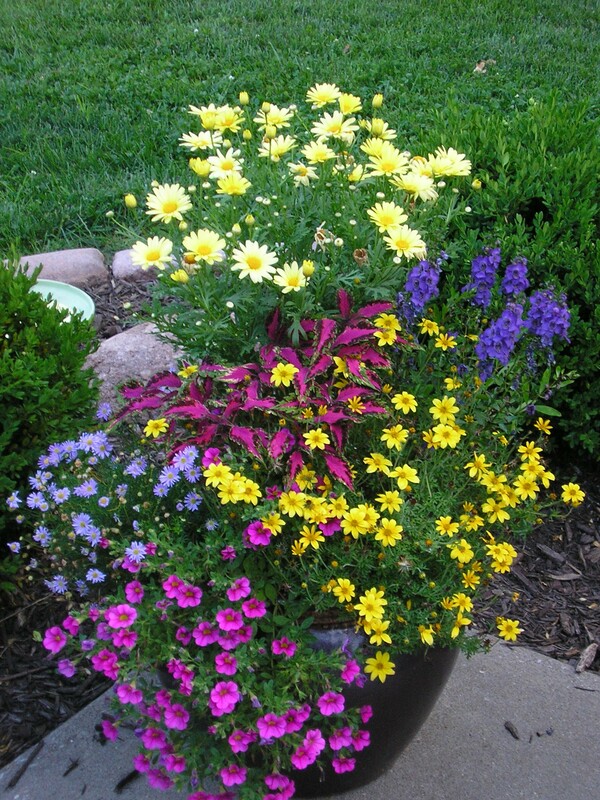 Potting Mix – It’s even more important than the flowers. Don’t skimp on the potting mix. The soil you choose is super important and can make or break how well your container does during the growing season. 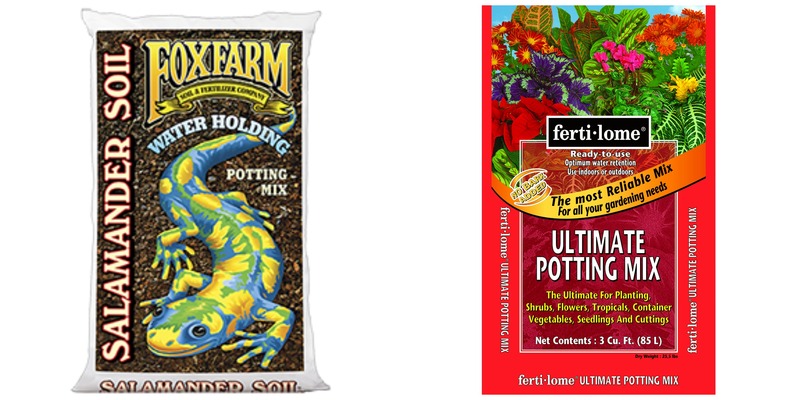 Two of my favorite potting mixes are Ultimate Potting Mix by Fertilome and Salamander Soil® Potting Mix FoxFarm. Fertilome Potting Mix is a peat based potting soil so it needs to be kept evenly moist and should not be left to dry out. I have used this soil in all my containers but especially like it for large containers. It also works great in shady locations where you don’t want or need the excess moisture. Salamander Soil® is excellent at retaining moisture and works especially well in smaller containers or full sun areas. If you travel a lot and your kids or husband aren’t consistent with watering, then this is the soil for you. A common question I have received over the years is if you should put gravel in the bottom of the container. The answer? No! The thinking behind this garden myth is that it will increase drainage. And yes, water does move quickly through gravel but soil also holds water. This water gathers towards the bottom of the soil before it is saturated enough to run out the bottom of the container, or through the gravel. By adding gravel to the bottom of a container, you are eliminating the extra area where that water would normally rest. The roots may then set in MORE moisture than necessary causing the plants to suffer or die. Gravel also has this annoying habit of lodging itself in the drainage hole and acts as a plug, eliminating all drainage possibilities. So what should you put at the bottom of your containers? Nothing. Pro Tip: Unfortunately, the good-quality potting mix doesn’t come cheap. To save money in large containers, I’ll use the plastic pots that the plants come in and turn them upside-down in the bottom of the container before I add the soil. This helps fill up some of the space while allowing water to move freely. Don’t have any? 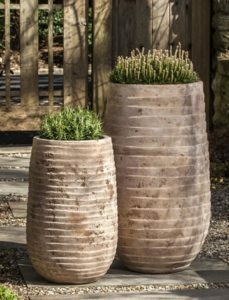 Many garden centers will often have some 1, 2 or 3-gallon pots lying around that they will be more than willing to give to you. Just ask! Planting it up – now the fun can begin! Here’s the thing – I’ve stood with customers for hours (seriously, hours) trying to pick out the perfect shade of geranium despite the fact that most flowers will start out vibrant and fade as the flower dies. I’ve had customers stressed, like super-stressed, because they were afraid they would choose the wrong plants. Honestly, we spend more time worrying about what our neighbors and friends think as opposed to what we actually LIKE. Well, stop it!! It’s your garden – plant what you like!!! The beauty of annuals is that they come with an expiration date. Four months and you’re changing them out for Mums – unlike a kitchen cabinet that is fairly permanent and a potential lifetime of ‘what was I thinking’. With annuals, you only have four months of staring at your questionable choices. 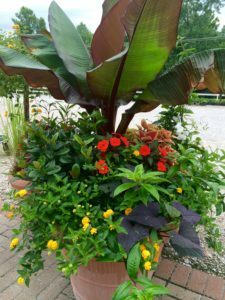 Banana Tree, Ixora, Sunpatiens, Coleus, Lantana, Sweet Potato Vine and probably something else – Sometimes I get a little excited! 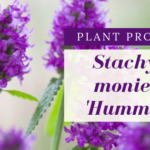 Thriller: You want to WOW with your thriller plant. You can use purple fountain grass or coleus as your thriller, they are both spectacular plants, but sometimes you just need to think bigger. To give a large container some serious height and show, the typical 4″ annual just isn’t going to cut it here. Let tropical plants take this roll in a container. Hibiscus, Tibouchina, Oleander, Banana and Palms are great selections to fill this role. Try the tree forms of these same plants when you want the height but don’t need the width. Filler: Filler is basically the body of the container. In large containers, I’ll use a showy plant as well as a foliage plant that provides either foliage color or texture. Ultimately what you use as filler will depend on the size of the container. 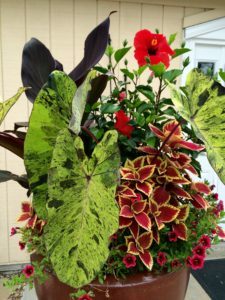 A couple of my favorite 4″ fillers (or even thrillers if the container is small) are Coleus, Purple Fountain Grass, and Dragon Wing Begonia. 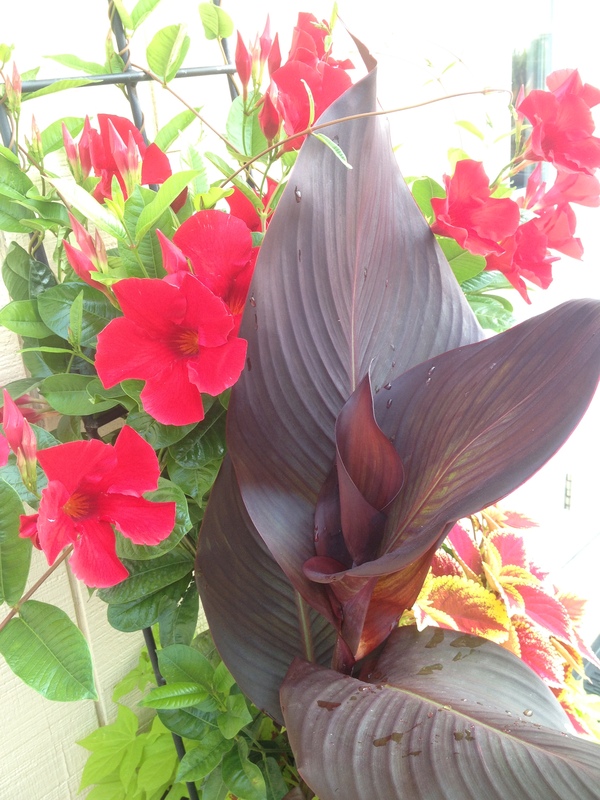 Some great fillers for large containers are Mexican Petunia, Oleander, Canna, Elephant Ears, and Ferns. Spiller: The spiller is just that, a plant that ‘spills’ or cascades over the side. Lantana, Scaevola, Calibrachoa, Torenia, and Ivy are a few of my favorites. Pro Tip: Occasionally we have a job that involves a last minute party and needs containers that appear to have been growing for some time and not just a day. 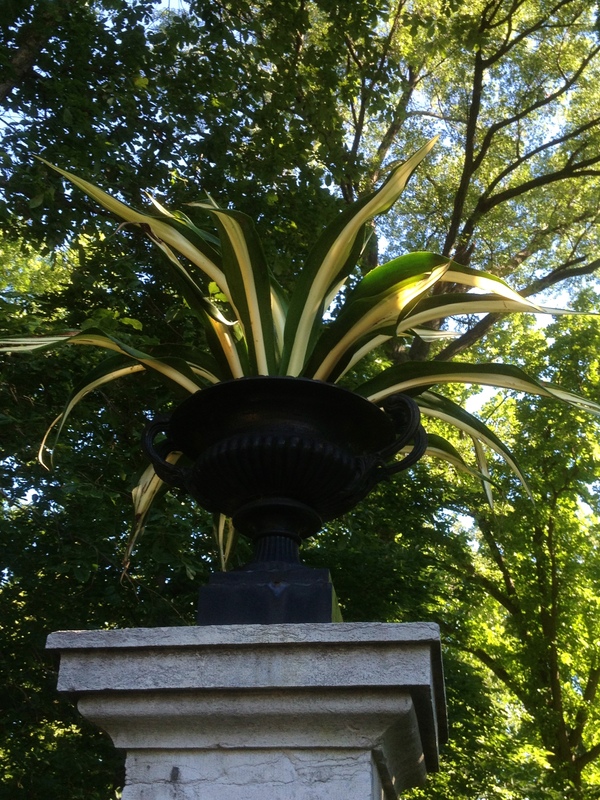 While the tropical plants give that immediate gratification we seek, the 4″ cascading plants often seem a bit…dinky. This is where hanging baskets come into play. Hanging baskets have been growing for months and offer the height, width, and length needed for a mature container. Texture: When your plant choice is based on the flower or when all the flowers are of the same size or texture, the container can become muddled. Basically, you aren’t able to focus on any one plant in particular and the arrangement becomes a mass of potentially beautiful but unorganized color. By using different textures and foliage colors, you can create an anchor for everything else to shine and in turn, the foliage will also shine. 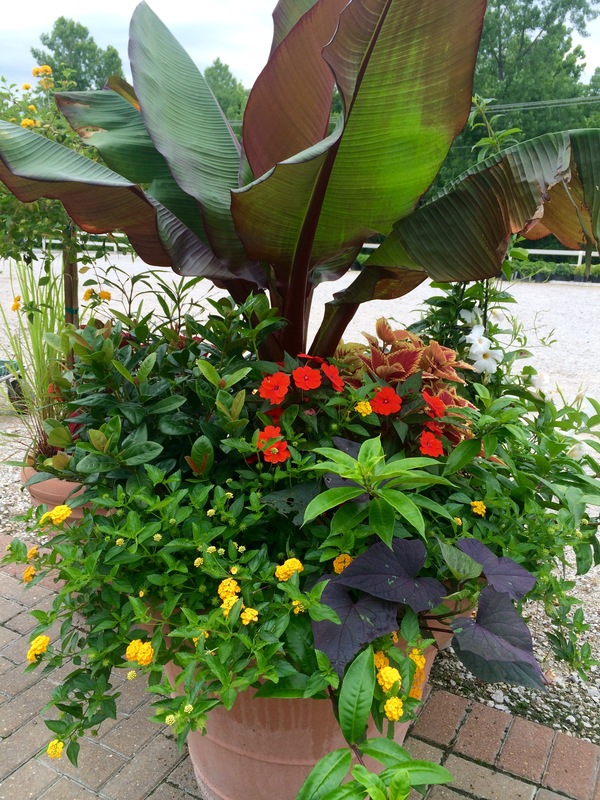 Elephant Ears, Banana, Croton, Coleus, and Cordyline are perfect plants for achieving this. The dark burgundy and blacks along with the bright colors of Croton and Coleus create excellent accent colors. I’ve also achieved this with grasses such as Hakonechloa (a perennial) in shade containers. The bright chartreuse color and soft foliage pairs well with New Guinea Impatiens, Palms, and Torenia. But not all flowers need to be eliminated to achieve this look. I’ve been successful with the glossy dark foliage of Gardenia and the broad, colorful leaves of canna. Smaller Pots: While I’ve been focusing on the large containers, small containers can be equally stunning. You can achieve a similar look by following the same rules just on a smaller scale. In this case, Coleus may be your thriller, Angelonia your filler and Calibrachoa your spiller. Or you can totally think outside the box and do as I did with this container. I walked around the garden center and picked out what I thought look pretty that day. Yep, in true girl fashion, I went with what I thought was pretty. Should it have worked? No. It’s pretty much the flower on flower thing, with all the flowers being of the same size and similar shape. Why did it work? The bright pink Coleus in the center helps to anchor the rest of the arrangement. That being said, I did put too many plants in my container and couldn’t keep it watered past July. Oops…pro fail! Pro Tip: Unless you have a large container, don’t pack the plants in too tightly – let them have room to grow! 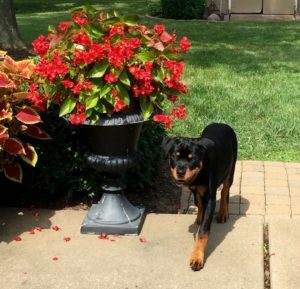 Shrubs & Perennials: Annuals shouldn’t have all the fun! One of my favorite shrubs to use for height in containers is ‘Fine Line’ Columnar Buckthorn. Its columnar form allows me to plant other annuals around it while it provides a wonderfully soft texture against plants with solid foliage. 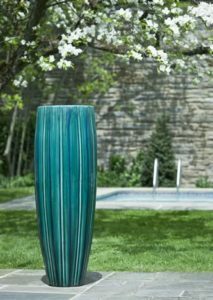 Perennials also off spectacular texture and color. With the selection of shade annuals being somewhat limited, I will often use shade perennials to fill my containers while tossing in some annuals for a pop of color. All Alone: Sometimes we just want to be alone, am I right? Well, so do our plants. Sometimes we just want to be alone! Sometimes a plant is so architecturally spectacular that it needs to be on its own to shine. 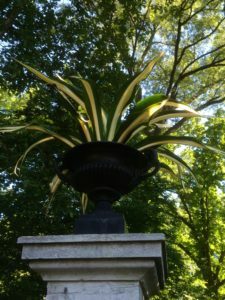 Planting a singular plant creates a clean, formal appearance and works well in urns and small containers. A large Palm or Boxwood surrounded by variegated ivy can create a fantastically elegant container while a single begonia variety pops with color. Proper Care – the fun isn’t over yet! You’ve created your stunning container but the fun isn’t over yet – now you need to keep it alive! Fertilizer: Many potting mixes will have fertilizer in them, but I would still recommend applying a slow-release fertilizer when you plant and use a water soluble plant food during the summer. 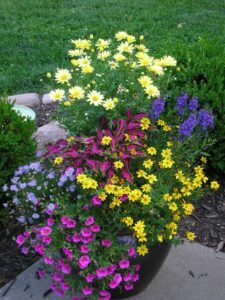 You’ll fertilize your annual containers more than any other plant in your landscape because every time you water, some of the nutrients will drain out the bottom. Water: Containers need regular watering, especially once we reach the summer heat. Expect to water every couple days in the early spring and every day by June. If you are uncertain, check the soil. That is the best way to know if a plant needs water or not. As you can see, while there are some simple rules to follow when creating a container, the door is still wide open to interpretation. Break out of your container rut and try something new. If it doesn’t work out this year – there’s always next!! Proving a single variety can make a stunning display while shamelessly showing off my beautiful pup!